At a time when the recording and reproduction of music was in its infancy, the factory "M. Welte and Sons, Freiburg i. Br. ", famous in its time, caused a sensation with a new invention. A procedure had been developed by which "all nuances of the personal performances of pianists" could be registered and reproduced. The device for the reproduction was patented and called Welte-Mignon. By means of perforated paper strips, rather like punch tape, the playing of famous pianists could be reproduced fully automatically and authentically. After the first demonstrations the Mignon was hailed by the Press as a new wonder of the world. The device, controlled as it were by a ghostly hand, was built into such famous makes of piano as Steinway, Bechstein, Blüthneretc. In the so-called "Vorsetzer" version (vorsetzen = to place in front of) (Photo 1), it could be placed in front of any instrument which it was then able to play with felt-lined wooden fingers (photo 2). The Welte-Mignon was manufactured in limited numbers and sold at immensely high prices. Thanks to a clever advertising campaign, it was soon to be found in the music salons of the aristocracy and the nobility or in the possession of industrialists and landowners. The Mignon played in the salons of the fast steamships which cruised between Hamburg and New York. Up until the outbreak of the first world war about 2500 musical items had been registered, the majority of them works of classical musical literature. The post-war period brought a new boom, which was however short-lived. The nature of entertainment had changed, even in the aristocratic salons. Shimmy, One-Step, Tango-Milonga and Valse Boston were the latest fashionable dances, propagated through revues and musicals. Welte had to adapt itself to the new taste; there was less and less demand for concert pianists. Rudolf Serkin was the last concert pianist to record for the Mignon. With the coming of the international economic crisis, improved records (electric recording) and radio, the Welte was soon forgotten. Production was stopped in 1932; soon after this, before the end of the decade, the first instruments were literally scrapped, and only a few instruments survived the nights of bombing of the second world war and the phases of modernisation which immediately followed. The characteristic of the piano roll which at the time bordered on the miraculous consisted in the fact that piano pieces with all the rhythmic and dynamic nuances of pianists were registered on them. Thus for the first time in the history of music it was possible to store a pianist’s playing faithfully and to reproduce it later with the help of an instrument. The Welte piano rolls consist of paper rolls, rather like punched tape, and possess 80 or 88 control tracks, according to type, for the individual notes of the piano (Photo 3 + 4). In addition to this they possess further tracks at the edges for controlling the dynamic nuances, and for operating the pedals. When a roll is played, all the tracks are read off pneumatically by suction via the so-called "tracker bar". 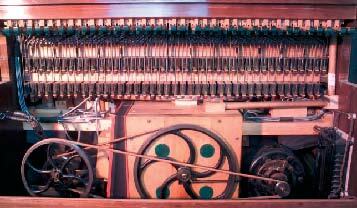 Whenever a perforation in the roll passes over the tracker bar a valve connection causes thecollapse of a small bellows which strikes the corresponding note of the piano. Simultaneously, additional controlling impulses in a particular coded form are passed by way of the tracks at the edges to a control device. 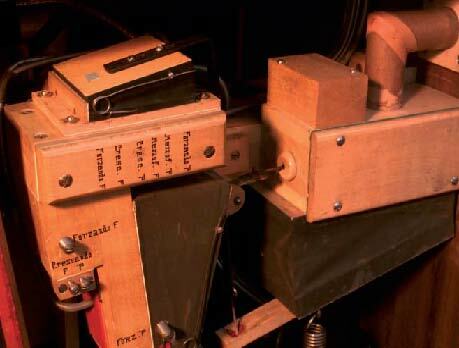 This device controls the strength of vacuum with which each individual note bellows is closed (Photo 6). The stronger the vacuum, the louder the piano note is struck. The control of the volume is infinitely variable from the gentlest pianissimo to fortissimo and can react as quickly as the nature of the pianotechnique demands. Thus the piano rolls contain in digital form (hole – no hole) all details of a pianist’s playing, as it was played and registered by a pianist of the time. In order to make sure that the reproductive device reproduces the music on the sound rolls faithfully and authentically, not only is a careful and thorough restoration necessary, but also considerable adjustments have to be carried out. The adjustment is made at first according to defi nitive instructions given by the firm itself with the help of a special roll for testing adjustment. It contains a particular system of perforations to check all controlling functions. In addition, the dynamic extremes pp and ff must be adjusted individually according to the method of playing and the location of the instrument. The volume of the bass and treble is controlled separately. Because of this the dynamic differentiation of notes sounded simultaneously is to a certain extent limited. For a long time it seemed impossible to adjust the tempo of the piano roll correctly and suppress deviations in running speed. Several control systems in the complicated technique were not precisely adjustable. Older recordings of Welte-Mignon piano rolls show this problem clearly. Even the relevant literature, which is fairly scanty, blames the unsatisfactory technique of the Welte device for the tempo problems. Today we know that several instructions for adjustment had been forgotten. Exact specifications exist which originate from the firm itself and which determine how fast the paper strip must run over the scale block. Corresponding measures can be taken to ensure that the speed of the piano roll remains constant even towards the end of a paper roll. The most recent measurements carried out on the Vorsetzer used for this recording demonstrate the astonishing precision of the Welte system. Short-term deviations of speed are less than 0.5%. The overall playing time of longer piano rolls deviate no more than 2% from the desired norm. However, since they do not result in any kind of deviations in pitch, these slight deviations in speed are hardly audible. If strange features are noticeable in the playing of individual pianists, there are only two reasons far this (apart from the partial limitation of the dynamic differentiation mentioned above): the method of playing itself or inaccuracies originating from the recording or the reproduction. Reading concert criticisms of the time, one can quickly find indications of conceptions of playing which seem unusual to us. The audience demanded an individual interpretation from the pianist at least as much as a faithful rendition of the music. Moreover, neither audience nor pianist had any way of checking the standard of the performance by listening repeatedly to a record. 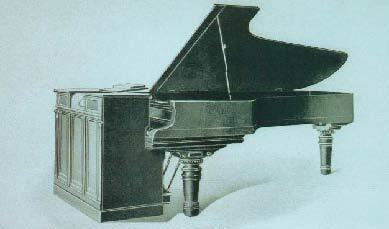 By means of the Welte reproductions the pianists could for the first time hear themselves. We know from contemporary writings that in several cases they became aware of their own mistakes in this way. When producing the piano rolls, 10–15 pieces were frequently registered in one day, not because of pressure of time, but because of a different attitude to music. The registration devices which were set up in Leipzig, Freiburg and New York have either been lost or were destroyed during the war. We can only speculate about the way they functioned. We may assume, however, that their precision was comparable to that of the reproducing instruments. We can reconstruct according to eye-witness accounts that for the registration a paper roll was marked with a writing implement. Lines marked the notes, the volume was presumably represented by curves. After the music had been registered in this way, a roll was punched by hand which could then be mechanically duplicated as often as was wanted. It is no longer possible to establish the extent of the inaccuracies or corrections in the process of transferring the registration of the music to the punched roll. The whole process of registration was always a wellkept secret of the firm and has never been revealed. This only adds to the enormous fascination of the piano rolls. Photo 2: The felted fingers seen from below. 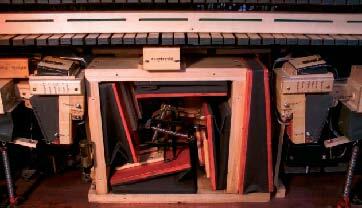 The "Vorsetzer" is pushed up against the piano keyboard and adjusted for height so that the felted fingers lie exactly on the keys. Photo 3: A red roll seen playing. Photo 4: Welte produced each recording on rolls in two different formats, one red, the other green. 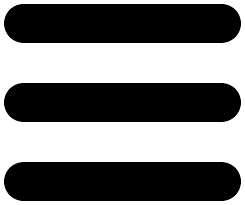 Their musical results are the same, but in other respects, e. g. their width, they differ; thus they cannot be used on the same "Vorsetzer". Some recordings are now lost or exist in only one format. 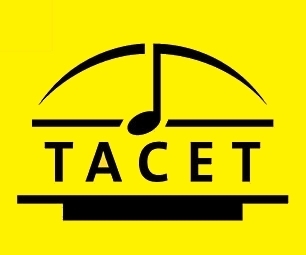 For these recordings, therefore, TACET has used two Welte-Mignons so that both formats could be played and re-recorded. Photo 6: "Expression mechanism" – one of the numerous points at which the “Vorsetzer” must be precisely positioned that all details can be accurately reproduced.